LabourList readers believe that Labour should back freedom of movement after Brexit, the latest survey has found. In its 2017 manifesto, Jeremy Corbyn’s party pledged to end the free movement of EU citizens post-Brexit. But over 83% of respondents to our latest readers’ survey say it should continue as part of the UK’s future relationship with the EU. Although ending free movement remains party policy, frontbenchers Keir Starmer and Jonathan Ashworth have recently suggested that Labour could “explore” the option of free movement of workers. 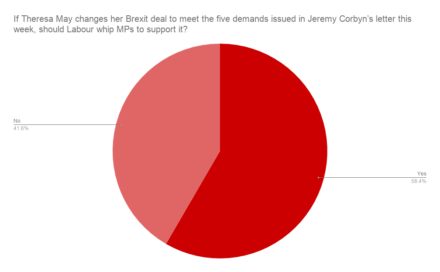 The new survey results also show that LabourList readers want the Labour leadership to support Theresa May’s Brexit deal if it meets the five demands issued by Jeremy Corbyn last week. Over 58% of 5,153 respondents said the opposition party should whip MPs to back the Tory deal if it includes European customs union membership, “close alignment” with the single market, keeping pace with EU rights and standards and more. On antisemitism, 52% of readers agreed with John McDonnell’s stated view that claims of antisemitism within the party are not part of a “smear campaign” against the leadership. Just over 48% did not agree, however. 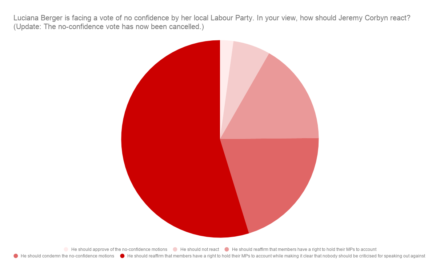 Last week, Luciana Berger – an outspoken critic of Labour’s handling of antisemitism – faced a vote of no confidence by her local party. The two motions of censure were later withdrawn after top party figures including Tom Watson said the backbench MP was being “bullied”. Some called on Jeremy Corbyn to intervene and offer a comment on the motions, but he declined to do so. 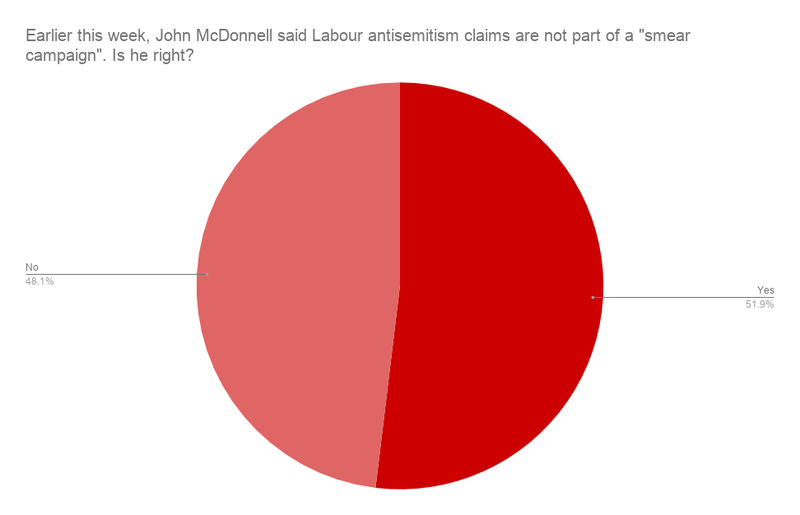 Only 6% of readers thought this was the right decision, as the majority of respondents said “he should reaffirm that members have a right to hold their MPs to account while making it clear that nobody should be criticised for speaking out against antisemitism”. Over 20% said Corbyn should condemn the motions, while just over 2% thought he should express approval. The motions by Wavertree Labour members have now been withdrawn and the vote called off. 1. If Theresa May changes her Brexit deal to meet the five demands issued in Jeremy Corbyn’s letter this week, should Labour whip MPs to support it? 2. Should Labour back free movement as part of the UK’s future relationship with the EU? 3. Earlier this week, John McDonnell said Labour antisemitism claims are not part of a “smear campaign”. Is he right? The survey was open from 8am on Friday 8th February until 8pm on Sunday 10th February. Thank you to all 5,153 readers who took part.